The Importance of Being Earnest, a “Trivial Comedy for Serious People” is a play by Oscar Wilde. First performed on 14th February 1895 at the St James's Theatre in London, it is a farcical comedy in which the protagonists maintain fictitious personae to escape burdensome social obligations. Working within the social conventions of late Victorian London, the play's major themes are the triviality with which it treats serious institutions, such as marriage, and the resulting satire of Victorian ways. Contemporary reviews at the time all praised the play's humour, though some were cautious about its explicit lack of social messages, while one considered it the culmination of Wilde's artistic career so far. Its high farce and witty dialogue have helped make The Importance of Being Earnest Wilde's most enduringly popular play. The successful opening night marked the climax of Wilde's career but also heralded his downfall. The Marquess of Queensberry, whose son Lord Alfred Douglas was Wilde's lover, planned to present the writer with a bouquet of rotten vegetables and disrupt the show. Wilde was tipped off and Queensberry was refused admission. Soon afterwards their feud came to a climax in court, where Wilde's homosexual double life was revealed to the Victorian public and he was eventually sentenced to imprisonment. His notoriety caused the play, despite its early success, to be closed after 86 performances. After his release, Wilde published the play from exile in Paris, but he wrote no further comic or dramatic work. The Importance of Being Earnest has been revived many times since its premiere. It has been adapted for the cinema on three occasions. In The Importance of Being Earnest (1952), Dame Edith Evans reprised her celebrated interpretation of Lady Bracknell; The Importance of Being Earnest (1992) by Kurt Baker used an all-black cast; and Oliver Parker's The Importance of Being Earnest (2002) incorporated some of Wilde's original material that had been cut during the preparation of the original stage production. 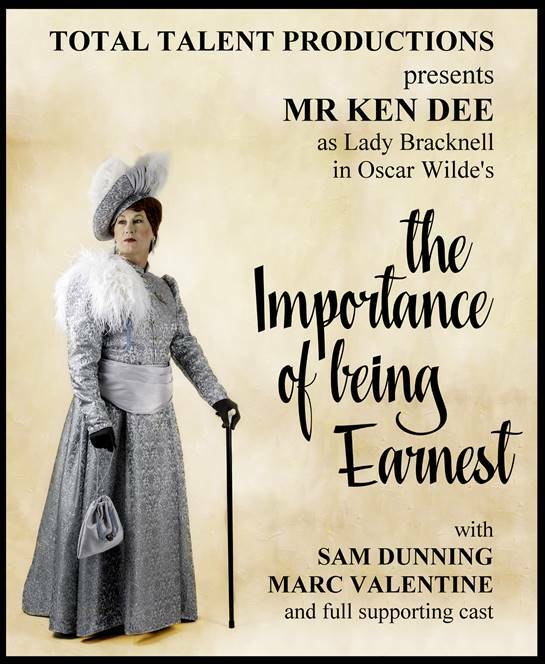 Mr Ken Dee very much believes Oscar Wilde’s inner intention was that the part of Lady Bracknell should be played by a man. Had the society of the late 1800’s been as accepting as today’s modern society then this production is perhaps how Oscar Wilde imagined it should have been cast.